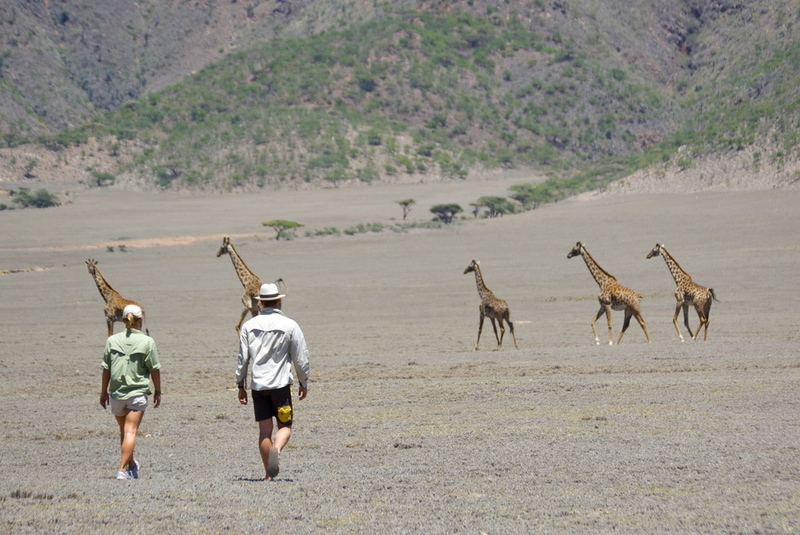 With a huge abundance of game and extraordinary scenery Southern Tanzania should be far busier than it is. The Selous, occupying an enormous land area of 55,000 sq.km. is the largest Game Reserve in Africa. The Reserve is one of Africa’s greatest wilderness, where the forest and bush are untamed and the animals unmolested by man. The Rufiji River system which flows through the Reserve, flooding it during rain season, further limits human trespass into this animal kingdom which boasts of over a million wild animals including some of the biggest population of elephants in the world. Covering 18,000 sq.km. this relatively new and undisturbed Park is one of Tanzania’s largest elephant sanctuaries. Its name derives from the great Ruaha River which flows along its entire eastern border creating spectacular gorges and scenery. Hippo, crocodile and fish inhabit the river. The Park is rich in all forms of wildlife,except some of the typical plains animals such as Thomson’s gazelle,wildebeest and topi whose range does not extend into this area. Filling the floor of the Rukwa Valley – a minor fault of the western rift – Katavi National Park spans over a million acres. From the escarpments, fragile rivers run down through Tamarind, Fig and Albida forests to feed vast floodplains. Across these plains run the last great herds of buffalo in East Africa. Hippopotamus mass along the creeks, grazing and sparring in the high heat of the day; elephant shake fruit from the great borassus palms. This truly is the land of the megaherbivores. 150km down the eastern shore of Lake Tanganyika is a mountainous forest island called Mahale National park. The mountains rise up from the water to 2500m, their western slopes carpeted with rich semi-tropical gallery forest; all around, below, is the somewhat monotonous, dry bushland that covers most of western Tanzania. Mahale National Park is home to the Mimikere Group Chimpanzee population – they cover a home range of around 15 square miles. These chimps are completely wild but are habituated to humans. The Park is situated in the south-western end of Lake Victoria. Covering an area of approximately 93 square miles, the Island has various indigenous animals including hippo, bushbuck, crocodile, marsh mongoose and vervet monkeys. The main attraction among these indigenous species is the sitatunga (antelope). There are no large predators. The range of habitat (savannah and open woodland to dense forest and papyrus swamps), makes Rubondo a bird watchers paradise. Its population includes both water and forest species – either residents of East and Central Africa or migrants from Europe and South America. Frequently seen are fish eagle, martial eagle, kingfisher, cuckoo, bee-eaters, sunbirds and many different water-fowl. For more information on the less visited, stunning landscapes in Southern Tanzania just drop us a message.